The Raspberry Pi is a nifty single-board device. With its capability of running pretty much any Linux operating system and tons of connectivity options, it’s perfect for a variety of projects. These range from gaming consoles to wall-mounted dashboards, and even voice assistants. Looking to smarten up your holiday? Check out these 10 Raspberry Pi-powered holiday projects which will have you belting out “Oh bring up some Raspberry Pi boards” instead of calling for figgy pudding! When it comes to holidays, lights are a must. While there are loads of Raspberry Pi Christmas light projects, Matt Johnson’s is by far the most impressive. Not only is his set up sprawling, but the dubstep show is riveting. You can read about his configuration which remains captivating, albeit a bit nuanced. This setup includes text messaging functionality, a pixel tree, matrix grid, and leaping arch. A technology consultant and software developer, Johnson offers a neat behind the scenes tour. If you want to make your Raspberry Pi holiday lights dance to music, check out LightShow Pi. System76 features a detailed tutorial for creating your own Raspberry Pi Christmas tree light show, complete with a parts list and steps. Nothing screams holiday more than a cozy fire. Although, many don’t have the luxury of a fireplace. Sure, there’s always the yule log video on Netflix, but why not build your own? Brian Federico shows how to cobble together a ‘pireplace’, or Raspberry Pi LED firelpace. It’s a simple project using a Pi board and Adafruit Neopixels. While pireplace doesn’t require many pieces or steps, it does call for a bit of soldering which Federico calls the toughest part. Granted, Federico blames his “...weak soldering skills…” to take that as you will. With smart home technology including Amazon’s Alexa, the Google Home, and Samsung SmartThings, the smart home space is all the rage. It’s even seeping into the gingerbread house realm. Estafannie De la Garza created arguably the best gingerbread house we’ve seen. Sure, it’s rather complicated and complete overkill. For this, De la Garza uses an Arduino, Raspberry Pi, buzzers, lights, servos, and soldering. For a gingerbread house. If you’re like me and usually in a bout of frustration finally just super glue your gingerbread house together because that included icing has to be defective, this may not be the project for you. However, if you’re armed with the patience and materials, this is a surefire way to win any gingerbread house competition. You’ve heard of Elf on the Shelf. However, Frosty the SPyman is a step up. This adorable little snowman livestreams video and even moves on its own. It’s the perfect way to monitor friends and family, making sure that the nice and naughty lists stay up to date. Arduino “having11” guy’s holiday project calls for a Raspberry Pi 3, Raspberry Pi camera module, servo, Adafruit PCA 9685, and jumper wires. On the software side, you’ll need MJPG streamer and Thonny IDE. For tools, you’ll merely need a screwdriver. Holiday lights are a classic, and smart lighting with a Raspberry Pi adds a modern twist. This DIY Raspberry Pi-powered holiday project uses Twitter to control lighting. Raymond Jones and Chris Poplawski explain how to use Twitter-Pi for controlling lights with various hashtags and mentions. This is ideal for the social media and tech savvy DIYer. Here’s a simple Raspberry Pi DIY project the entire family can enjoy. Create a digital photo frame with a Pi board, but set it to cycle through all of those embarrassing...er, totally adorable, Santa pictures. It’s an inexpensive, attractive, and easy to display. You’ll simply need a display, LCD controller, optional speaker, frame, and mounting options, as well as the Raspberry Pi, microSD card, and of course digital copies of those Santa pictures. Are Raspberry Pi Christmas tree lights not enough? 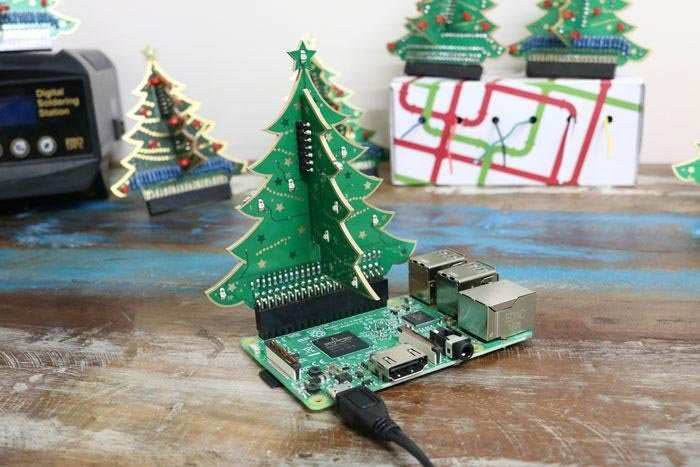 Try turning your Raspberry Pi into a Christmas tree. The Pi Hut offers a 3D Xmas tree which comes in two versions: a pre-soldered kit which is plug and play after snapping together some PCB parts; or a soldering kit which mandates complete assembly. Either way, it’s a neat little kit that turns your Pi into a mini Christmas tree. It’s packed with 25 LEDs which are controlled by their own GPIO pin. The Pi Christmas tree is compatible with all 40-pin Raspberry Pi devices and is ideal as an add-on for the Raspberry Pi Zero. Christmas carols are often pretty repetitions, and some are just downright awful. However, with Code a Carol, users must code “12 Days of Christmas” with Sonic Pi. This maker project is a fantastic foray into both the hardware and software side of the Pi, assuming you begin by setting up a Raspberry Pi from scratch. There’s no music or coding knowledge required. Remember the days of advent calendars with little pieces of milk chocolate nestled in each calendar day? Now, try a tech twist with the Sense HAT countdown to Christmas. It’s a digital advent calendar which shows a new picture each day between December 1 and December 24. This project employs basic programming, and like Code a Carol, it’s an awesome means of learning about the hardware and software components of the Pi. Unlike other Christmas Lighting DIY Raspberry Pi projects, this concept focuses on control. This Raspberry Pi project includes a waterproof box, touchscreen, and loads of connections. As YouTuber David W reveals, his concern was people making off with his holiday lights which isn’t in the spirit of Christmas. The result of his handiwork is a pretty impressive light display, but the controller box is arguably more fascinating. Raspberry Pi devices boast tons of project ideas. There are plenty of DIY Raspberry Pi-powered holiday projects, from lights and light controllers to coding carols. Want to expand beyond the Pi? Try this awesome light up music snow globe with an Arduino or create a DIY Christmas tree water sensor. Your turn: Which DIY holiday-themed Raspberry Pi projects do you recommend? Build Your Own Arduino Keyboard Synth!